Good friends know just what you need. Jacq’s package was the perfect surprise during a time when I’ve been a little uninspired with my knitting. 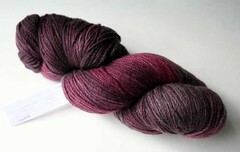 I mean, how could I *not* be tickled to make something out of the knittery’s cashmere merino sock yarn? Plus, chocolate, tea, handmade soap, and an eyemask — everything I need to make for a relaxing weekend. The yarn is *so* soft and is handwash-only, so I’m thinking about making a pretty scarf instead of socks. The color is perfect for use close to my face, and it would look great against a variety of colors of coats (including that green coat I’ve been hoping to find for three seasons now). I’m thinking a denser lace or stitch pattern would work nicely. Any ideas on a need-to-make scarf? Oooh, I love that yarn. Wow, what a great color. 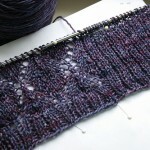 How about the Trellis Scarf from an interweave a couple of years ago? Lucky! I love that beautiful color. Watch out for that Violet Crumble…it’s delicious but the stuff sticks in your teeth like crazy! Definitely a nice package! I’m not much help with pattern suggestions, but I can’t help but notice that the yarn matches your blog perfectly. What about the Hypoteneuse scarf from Anne Hanson at Knit Spot? I think it is incredibly clever, and a Certified Mathematical Genius like you might be intrigued. 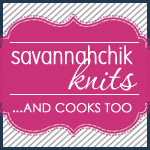 That Knittery yarn is scrumptious. For some reason, I think it would look great in the Shifting Sands scarf pattern (though I think it’s written for a heavier weight yarn, but only slightly heavier), but you could play around with it to make it work for the yarn you have. I think the stitch detail would highlight the colors of the yarn well. I absolutely love that color, makes you want to eat it! oh, and thanks for your comment on lambchop! she’s very missed. What a sumptuous color. Perhaps this is overdone, but the chevron scarf is lovely with a single color, and I get a huge amount of use out mine. 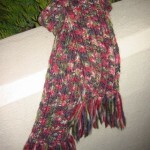 What about Christine’s Gift of Friendship Scarf? 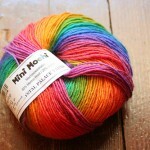 that is fantastic looking yarn! 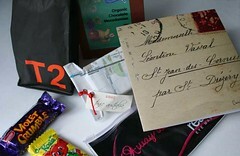 Such a thoughtful package! The color of that yarn is beautiful, but I cannot imagine a scarf pattern that would do it justice. Can’t wait to see what you do with it. oohh that looks fab. I’d try the candle flame pattern out there. the smaller version that is free. Although I’ve lost the link sorry. I think a scarf is an excellent idea!